Turn out the lights with our Plastic and Kraft Black Boxes. These versatile containers are perfect for storage, organization, and gifting. Fill with home and office supplies for a cool, stylish organizational tool. Use it to store all those photos, knick-knacks, and keepsakes that clutter up your room. Toss in a present and top with some ribbon for a gift box that’s a gift in itself. Available in Recycled Black Kraft and Black Plastic, you’ll be sure to find the right design to fit any purpose. And since they’re made of sturdy kraft paperboard or plastic, and both have reinforced metal edges, you can trust them to hold all your most valuable items. With a strong shoebox-style lid, they can even be stacked on top of each other without worry. 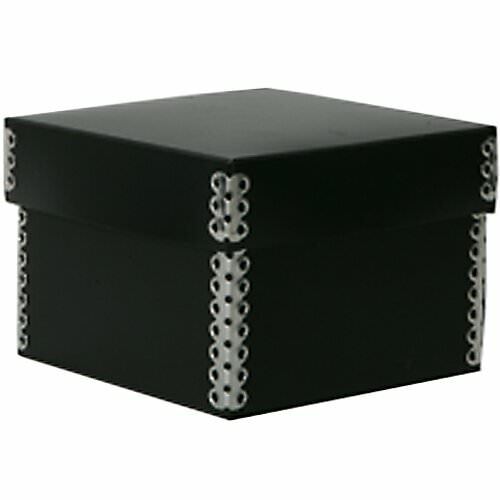 Black Boxes are available in 4 1/4 x 4 1/4 x 3. Available in Recycled Black Kraft & Black Plastic. Larger and smaller nesting boxes are also available in 3 1/4 x 3 1/4 x 2 3/4 & 5 3/8 x 5 3/8 x 3 1/2. Also available in clear frost plastic and Recycled Brown kraft. These are made in the USA. Size may be customized if ordering over 100 pieces.